We take pride in our trapezes. We TIG weld all bars, hand splice the ropes and hand stitch the elbow covers. Our standard single and duo trapezes ropes are made with high-quality, 100% cotton, 7/8 inch (22 mm) diameter four-strand rope from Langman in Holland. We include a 3/16 inch diameter Amsteel cable core rated for 4900 lbs to keep the rope lengths even and provide structural integrity. Ropes terminate at the top with integrated black 50 kN, d-shaped, auto-locking steel carabiners. 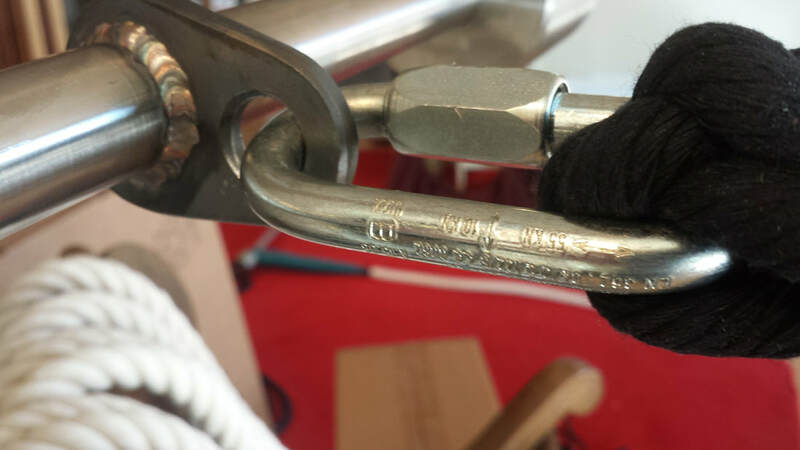 We use 8mm Maillon Rapide PPE certified 35 kN galvanized steel links at bottom in our standard trapezes with 22 mm diameter ropes. We use a faux suede upholstery fabric for standard elbow covers though leather is available for increased durability. This style eliminates the need for special carabiners to fit over large thimbles. We use a rope with a tight lay which is harder and takes longer to break in but lasts longer. Note if the aerialist twists against the lay (the direction) the rope is twisted, the rope may bunch or hockle. This happens to all twisted ropes regardless of material or type of core. As a result, Aerial Animals can not be held responsible for hockling of laid trapeze ropes and hockles are excluded from warranty coverage. Our standard trapeze ropes are 7 ft. We measure from the top of the bar to the attachment point (top inside of the carabiner. This length includes the knotted splice and carabiner, which is about 11 inches. The "working length" of the ropes, therefore, is approximately 10 inches less than the total length. Also, we make our ropes under tension to equalize the length of the cover and core. As a result they appear shorter than ordered but will stretch to proper length when weighted. Elbows are padded and covered with fabric to 18 inches above the bar. You specify bar length; 23 inches and 25 inches bars are most commonly requested. Elbow padding takes approximately 1 to 1.5 inch of space on the inside of each bar. A 23-inch bar has approximately 20 to 21 inches of working space and runs 25.5 inches from the outside of the elbow padding on one end to the outside edge of the padding on the other end. Duo trapezes include 5-inch ends extending past the center of the ropes. Budget trapeze $310. You pad and sew the elbow covers yourself and provide your own carabiners. Save $140! Ropes over 7 ft in length charges vary by type and diameter of rope. $6 per foot for 22 mm white/ecru 4-strand rope. Oval shaped carabiner (25 kN) preferred for rigging with swivels and /or a triangle plate to a single point. Screw gate carabiners instead of auto-locking no charge. Core 3/16-inch AmSteel or steel cable same price. Tabs below the bar to attach additional apparatus - $10 upgrade charge. Roll of black Mueller Athletic Tape $2.50 to tape bar. $30-35 shipping cost for single and $40 - 45 for duo trapeze. Delivery times can range from 2-6 weeks depending on orders in our queue. 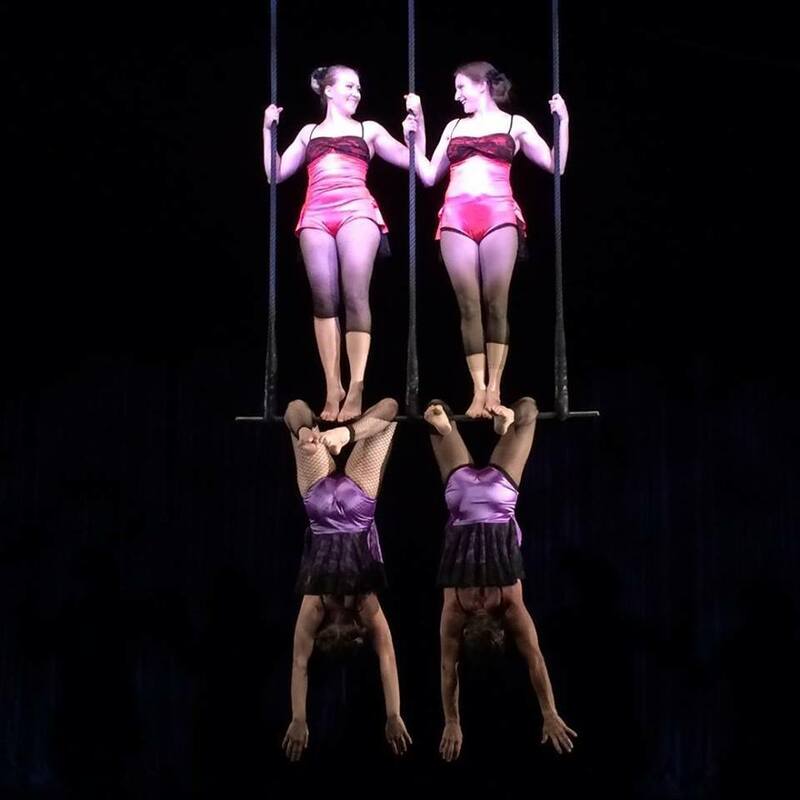 ​Please fill out our Custom Trapeze Order Form and I will either send you an email asking for more info or send you a Paypal invoice with detailed itemized billing, including shipping. There is no obligation to buy, it just gets all data in the system and provides you with a solid quote. We will invoice you or contact you if more information is needed. Static Trapeze or danse / single point trapeze? We make static trapeze. We have noticed a trend toward single point or dance trapeze crocheting and wrapping in the ropes. This has caused hockles or bunching in the ropes. Swivels can mitigate the hockling, but a problem occurs if the rope is held from twisting between the swivel and the trapeze when performing moves such as infinity turns, the rope will still hockle especially if the aerialist twists against the lay (the direction) the rope is twisted. This happens to all twisted ropes regardless of material or type of core. As a result, Aerial Animals can not be held responsible for hockling of laid trapeze ropes and hockles are excluded from warranty coverage. The process: First fabricate a bar according to your specifications using laser cut tabs, TIG welded 360 degrees on both sides. We then make and splice the Amsteel cores. Next, we wind the rope over the core and splice the ropes, which are then attached to the bar with Maillon quicklinks. The top spice is finished with the Aerial Animals signature Wall and Crown knot and integrated carabiner. Our elbow covers are sewn by hand. The top of the elbow covers are whipped at to secure them. Voila finished trapeze! Youth bar lengths are limited to 20 inches or less and ropes are 5 and 1/2 ft. All trapezes are constructed to ensure safety and quality at a great price. We use 5/8-inch diameter three strand cotton rope with a 1/8 inch AmSteel core to keep ropes lengths even. Trapeze elbows are padded to approximately 15 inches above the bar. All bars are 1 in diameter schedule 40 steel pipe or solid 7/8 in diameter steel. Our trapezes provide great quality, value, and fun and are priced to encourage people to buy youth sizes for small students ( up to 14 years of age) for safety! Youth trapeze in the middle of the standard adult trapeze for comparison in photo.